The Okinawan Martial Arts Academy, LLC., which is rooted in the ancient arts of fighting forms (a.k.a. katas) from Chinese Kung Fu and the Okinawan Arts of Uechi Ryu, Goju Ryu and Shorin Ryu, was conceived by Sensei Bruce Goldberg. Sensei Goldberg studied martial arts in the 1980's under Soke (founder) Larry Byers at the SanShin School of Martial Arts. As it was always one of his dreams to operate his own martial arts academy, Sensei Goldberg built OMAA from the ground up. Although he was able to see his dream come true, he was shortly after diagnosed with cancer in late 2005 and passed away in May of 2006. In keeping with Soke Byer's and Sensei Goldberg's wishes, Sensei Keith Jakle, who had trained in the Art since 1977 and was Bruce's senior under Soke Larry Byers, assumed control of the school, teaching classes in the style of Soke Byers, called SanShin BanYingRuan (Half Hard, Half Soft Martial Art). Sensei Jakle has taught at the YMCA and other facilities since 1986, and has had his own students and teachers at other locations. He merged the two groups of students and teachers into one and is now the Kouchou (Teacher of teachers), Shihan (Master) and owner of OMAA. Shihan Jakle continues to train with his Mentor and Sensei, Soke Larry Byers, in the traditional katas and forms of the art, and teaches those forms to his instructors and students. For more information about Soke Byers and the San Shin or Ban Ying Ruan discipline, please visit the San Shin Ban Ying Ruan Karate Online Magazine. Shihan Jakle (right) with Don Williams, 1980's. Shihan Jakle tests students during a black belt ranking. 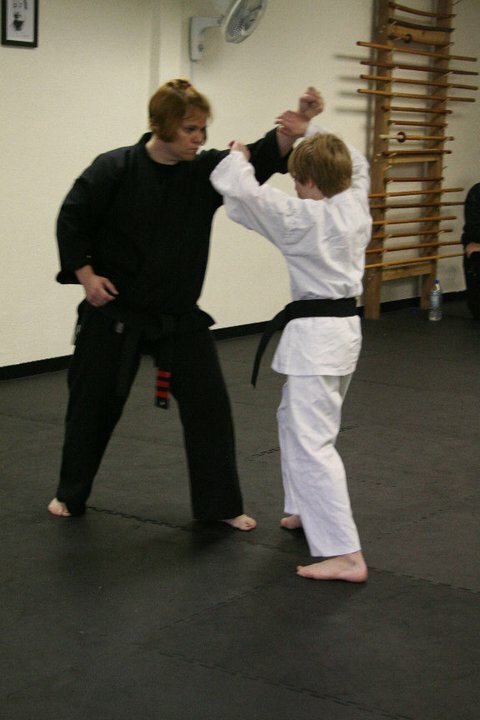 Soke Byers testing a student during a black belt test. Sensei Kelli (Ballard) tests the black belt student. Shihan Keith Jakle awards a black belt. Young black belts sparring / testing.